When we talk about ‘Indian food,’ we are making the same mistake as when we say ‘Italian food.’ The food geography of India is colossally diverse, and India did not even exist as a single nation until Britain invaded its component parts and found things easier with just one Governor. In its simplest sense, ‘Indian’ food can be carved up according to the ordinals of a compass, and it all comes down to oil. In Kerala (south), coconut oil is used; in Rajasthan (west), sesame oil is used; in Kashmir and Himanchal Pradesh (north), mustard oil is used, and finally, in the east, heading out towards Bangladesh, groundnut oil is king. Each of these oils has a different smoking point, and can therefore be heated to different temperatures. The higher the temperature, the more efficient the extraction of essential oils from the spices. This is why a sambar of Kerala is mild, and a vindaloo of Goa (west) is hot. Kashmir is a region that spans the disputed border between India and Pakistan. It became a popular retreat of the Mughals who could not abide the searing heat of the Indian central plain. 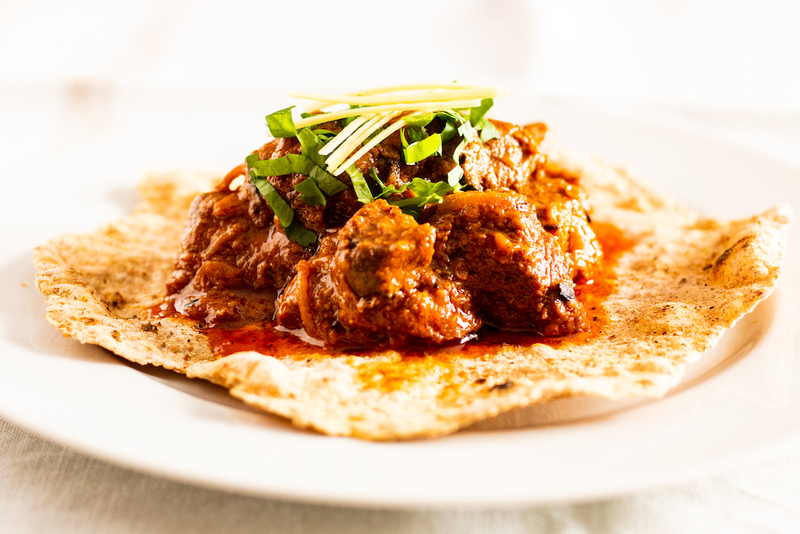 The Mughals learnt their cooking from the Persians, and this is the culinary journey of the rogan josh. Rogan josh is arguably the centrepiece of Kashmiri cuisine. Its name tells us a lot about how to cook it. 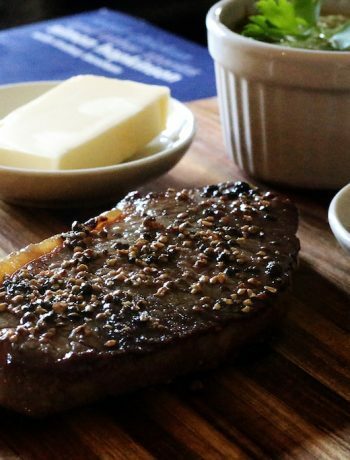 ‘Roughan‘ is thought to mean ‘clarified butter,’ which we know as ghee. Ghee has a mental high smoking point, so a rogan josh is never going to be a mild thing (others say that it means ‘red,’ therefore red meat). ‘Josh‘ is derived term ‘ghosht,’ which means slow cooked. So, we have a spicy thing that is slow cooked. But the reason it is slow cooked is critical – rogan josh is typically made with goat, and goat needs a very, very long time in a low pot before it becomes edible. Goat makes perfect sense when you think about the domestic animals that are husbanded in the Kashmir region (cashmere is not called cashmere for nothing). Having learned all that, I think you can work out for yourself why any food writer saying ‘check out by super-quick chicken rogan josh’ is talking very loudly out of their arse. 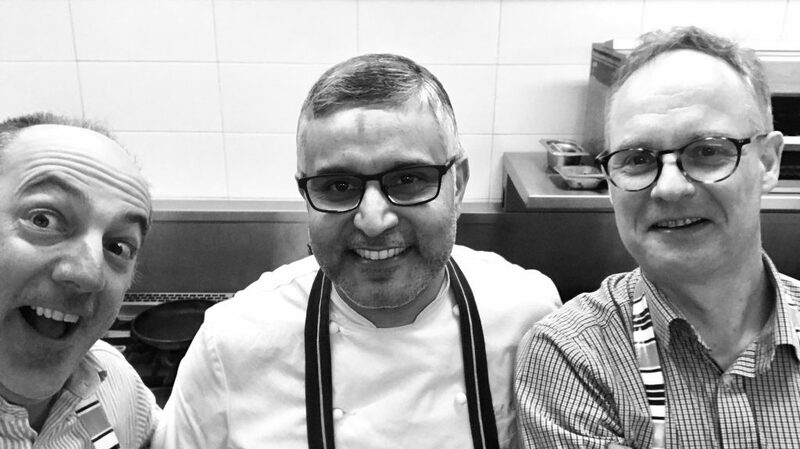 The Nosey Chef team was lucky enough to enrol on a course at Leith’s School of Food and Wine to learn how to cook Indian food from none other than Atul Kochhar. Atul was the first Indian chef to be awarded a Michelin star. He has run a string of successful restaurants, including the acclaimed Benares in Mayfair. When we met him, he was on Day 3 of opening Kanishka, also in Mayfair. Despite the pressure of an impending service in a new high-end restaurant, Atul was a patient and careful tutor. When describing how to make curries, Atul explained the whole oil thing and added that he does not tend to use ghee. The key piece of gen is the order in which a curry is constructed. It goes: oil -> whole spices -> onions -> ginger-garlic paste -> powdered spices -> tomatoes. Any meat is marinated in spice and yoghurt for a while and goes in after the paste. The degree of onion colouring defines the final look of the dish. At the school, we made a quail curry, some potato cakes, a dal, and saag paneer. Back home, I found myself with a shoulder of Peak District mutton, and just knew I had to make Atul’s version of rogan josh. We have reproduced his recipe here, with some additional notes on using a slow cooker, which can really help if you are using traditional mutton or goat. Kanishka can be found at 17–19 Maddox St, Mayfair, London W1S 2QH. Online booking is available or call +44 20 3978 0978. Whisk together the yogurt, saffron and ginger-garlic paste. Season with salt then pour over the meat. Cover and leave to marinate in the fridge for 2 hours. Bring the meat to room temperature before cooking. Pound the whole spices with a pestle and mortar to release the oils (but do not actually grind them). Heat the oil in a heavy-based pan then add the pounded spices and stir until the spices crackle (this may occur instantly). Add the onions immediately after the spices crackle to stop them from burning. Stir and cook until the onions are golden brown – add some salt to help break them down. The level of cooking is essential, and defines the final look of the dish. Add the meat with the marinade to the pan and cook until browned but not cooked through. It might stick to the pan but don't worry. Keep stirring and scraping the pan to develop the flavours. 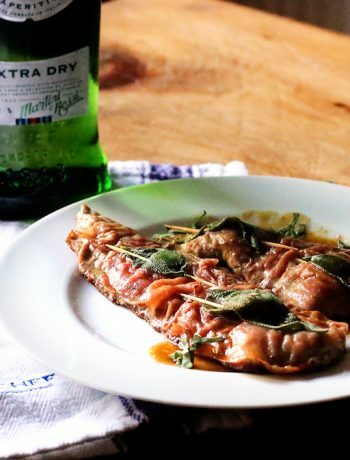 You can add a splash of water or lamb stock if the mixture becomes too dry, but it may need no additional liquid at all – certainly, fatty cuts like shoulder should not need any water. Add all the powdered spices and cook for 5 minutes. Add the tomato purée and stir until the meat is cooked through (this works for lamb). Alternatively, transfer the whole lot to a slow cooker and leave it on auto for a few hours (at least 5h) – this is definitely the way to go if using mutton or goat as opposed to lamb. If you do not have a slow cooker and are using mutton or goat, then cover and stick in the oven at 120˚C for a few hours, and make sure it does not dry out. 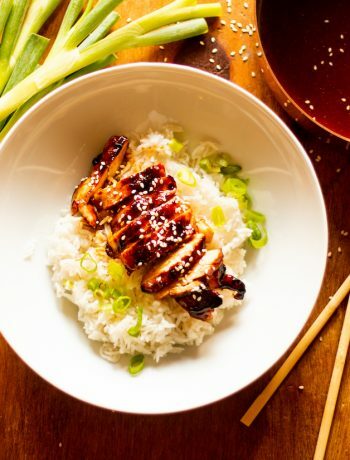 Serve garnished with coriander and thin shreds of ginger. Rogan josh is nice with a chapati, or with saffron rice. Ginger-garlic paste can be made by blending equal amounts of peeled garlic and ginger in a blender with a touch of neutral oil and a splash of water.